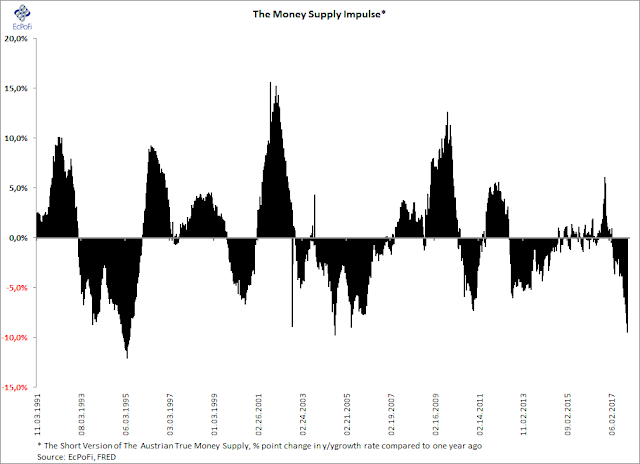 Following nine years of aggressive monetary expansion in the U.S., the money supply growth rate has now dropped back to Lehman lows. The sharp fall in the growth rate during the last year has pushed the money supply impulse down dramatically and close to a 26 year low. 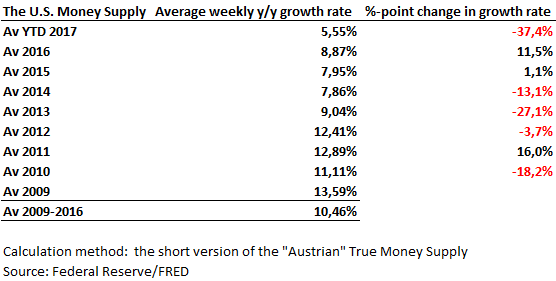 As stocks thrive on an expanding money supply growth rate and loath a falling one, it's only a matter of time before the next U.S. bear market sets in. This drop of money supply growth rate is similar to drop of it at 2002 - 2006. That was period of Economic boom, but not of burst. The money have been flow from USA to abroad (emerging markets, Europe). The effect was econimic boom all around the world and boom of consumption (commodity boom), because of rise in money supply of emerging markets (they print money to buy dollars to put it in reserves). One can see how that money flow cause drop in broad dollar index (https://fred.stlouisfed.org/graph/?g=fwmq). That flow also cause the drop in money suplly in USA banking system. When USA Money supply growth rate and Broad dollar index will reverse their curs, that will be first sign of end of ecconomic boom. 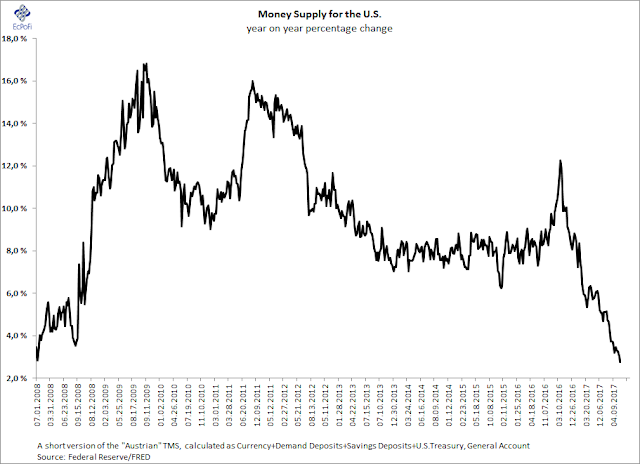 On the second chart you are correct, but not on the former with respect to your comments on the money supply growth rate - the money supply expanded significantly from 2001 until around mid 2005. There are always leads and lags, so this is not meant for timing.